The DG613 and DG813 pipe lasers are smaller in length than their predecessors—the DG511 and DG711. This shorter length is ideal when setting up the units in manholes with precast inverts and a tight radius. Both models have a grade range from -12 to +40 percent and are fully self-leveling over the entire grade range. The cross axis is also fully compensated providing quick set up and ensuring the laser will be level without having to manually rotate it in the invert. The DG613 and DG813 have a 150 meter (500 feet) working range providing a single setup to lay pipe from one manhole to another. The new RC803 remote control provides full function control and utilizes infra-red communications when in the pipe at a distance of up to 150 meter (500 feet). For “over-the-top” setups, the remote utilizes radio communications at a distance up to 130 meter (430 feet). Both models incorporate new features to save time and money. To reduce costly rework, the Line Alert will cause the beam to blink to notify the operator that the setup has been disturbed. Using the Line Set function, the beam can be moved up to 100 percent grade in few seconds and then adjusted left or right to perform first day set in a short trench. In addition, both models have a Line Scan functionality, which allows the user to quickly align the beam to the pipe laying target’s center which is placed in the last piece of pipe. The DG813 has advanced features when used with the SF803 Spot Finder beam detector. The Spot Align feature will automatically align the DG813’s beam to the center of the Spot Finder. This alignment feature can be used for an accurate and quick setup, to orient the beam towards the next manhole when used in a trench, through the pipe or when doing an “over-the-top” setup. Spot Match is used for checking that the pipe has been installed to the correct grade or for finding the grade value of an existing pipeline. 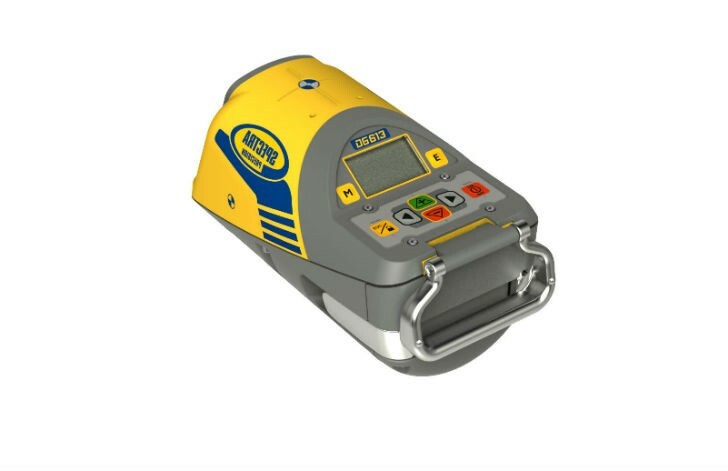 This can also be used to calculate the grade between manholes. SpotLok is used to lock the beam in a desired position for applications when the beam could be subject to environmentally caused drift such as dramatic temperature changes in the pipe or air stratification. Spot Search is used to align the Spot Finder to the beam over long distances out of the trench. The DG613 and DG813 are expected to be available through the Spectra Precision Dealer Network in North America in mid-February 2016.